When you're out riding your fat bike towards the end of the winter season, the snow on the road or trail can get a little slushy, so it can help to have a little protection for your back and your bike. 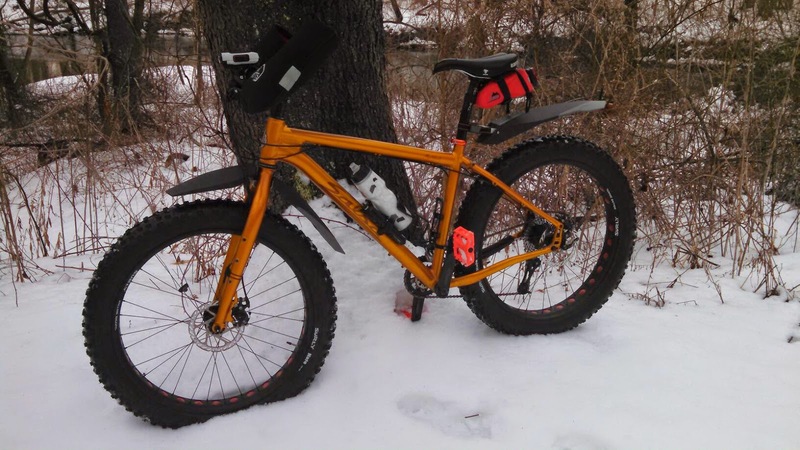 Up until now, finding fenders to fit a fat bike was a bit of a challenge. The fine German engineers at SKS have come up with a solution. The SKS Grand M.O.M. Rear and Grand D.A.D. 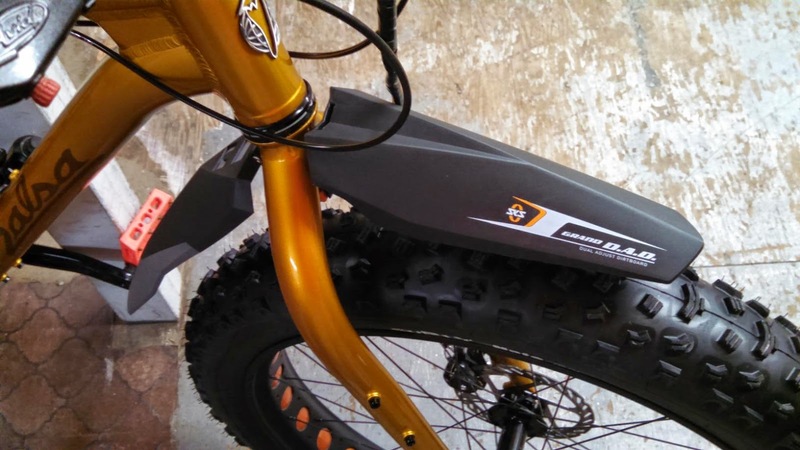 Front fenders use an easy clip-on/off attachment system, and have extra width for fat bike tire protection. 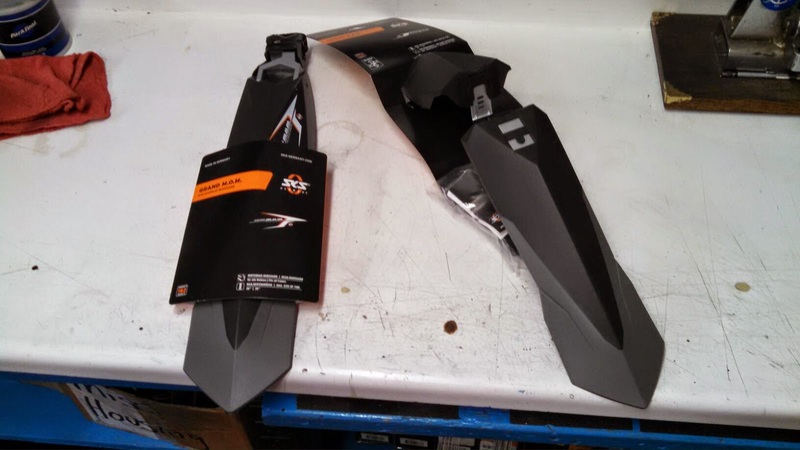 I obtained a pair of these fenders to try out for myself on my own Salsa Mukluk snow bike. The Grand M.O.M. Rear fender attached to your seatpost with an adjustable webbing strap. Adjustment and setup were really easy-peasy. The Grand D.A.D. Front fender installation was little more involved, but went without a hitch. 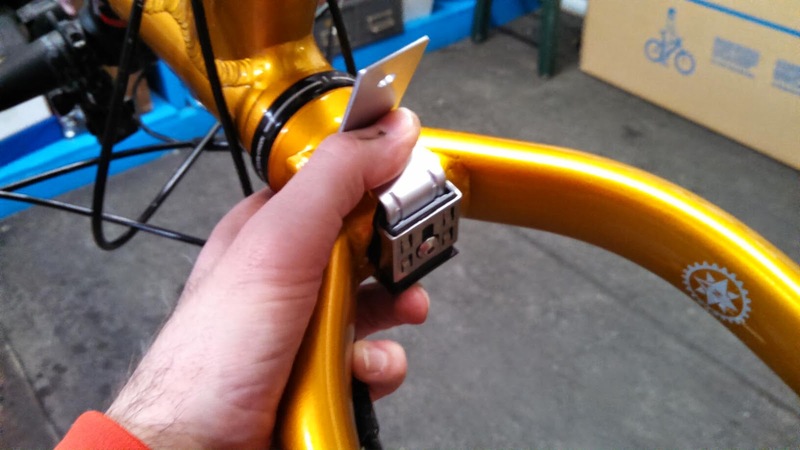 First, it's easiest if you remove your front wheel for easier access to the underside of the fork. Remove the front and rear halves of the fender from the mounting bracket, then remove the orange sliding cover from the mounting bracket. Choose the correct sized expander plug from the several provided in the package (you'll probably need the largest for a fat bike), attach it to the bracket, insert the plug into the hole under your fork, and screw it into place until the plug expands enough to hold the bracket securely. You may need to hold onto the bracket with your free hand to keep the whole thing from twisting as you tighten the expander plug screw. When you're done, snap the orange sliding cover back on the bracket, and slide it so that it lets you remove the bracket while the expander plug stays in your fork. Snap the front and rear halves of the fender back onto the bracket, then hold the whole thing in place as you slide the orange cover back to the "locked" position. Replace your front wheel and your'e good to go! 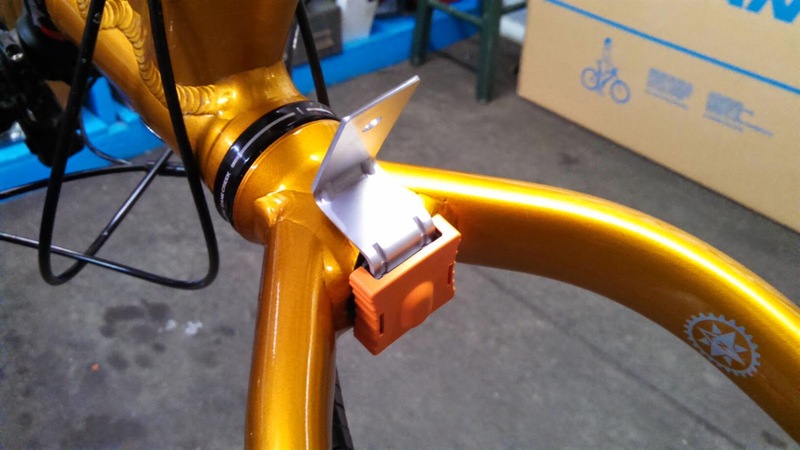 With a little practice, you can get adept at reaching under the fender to slide the orange bracket to unlock and lock it to remove and re-install the front fender as needed, without removing your front wheel every time. A side bonus is that the orange highlights on the SKS logos looked great with my Gold '14 Salsa Mukluk 2! In use, I found that the SKS Grand M.O.M. and Grand D.A.D. fenders did the job well. Of course, they don't provide the protection of a full-coverage fender like you'd find on a hybrid or touring bike, but they keep the major splashes under control, and are a good easy-on/off compromise. 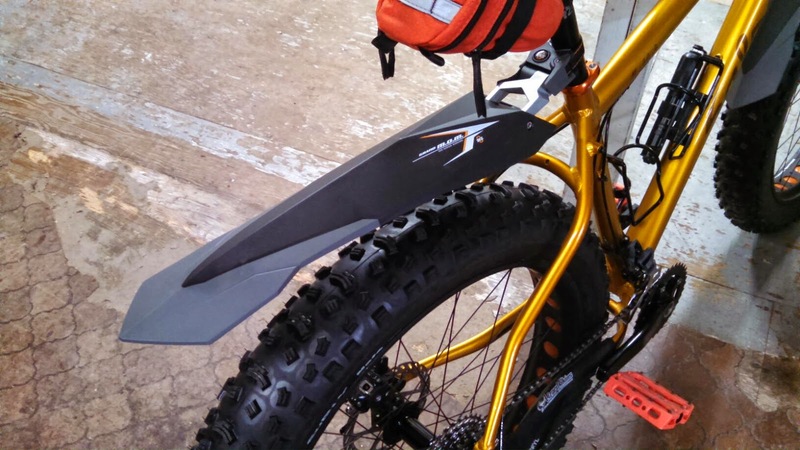 The bodies of the fenders are wide enough for the 4-inch tires found on most fat bikes. For wider 4.8-to-5-inch tires like you'd find on the Salsa Blackborow, Surly Moonlander, or Surly Ice Cream Truck, they won't protect the entire width of the tire, but they're better than nothing. I've used a lot of rear seatpost fenders in my day, and no matter high tightly you attach the strap, under rough riding conditions, they always seem to swivel and move around. Not so with the SKS Grand D.A.D. -- it's the most secure rear seatpost fender I've ever seen, and didn't move around at all for me. The SKS Grand M.O.M. Rear and SKS Grand D.A.D. Front fenders are in stock in the Century Cycles Winter Cycling Wonderland in Peninsula! How do you adjust the front fender angle to give more clearance to the tire? The brackets that hold the front and rear halves of the front fender in place are aluminum, so you could bend them (within reason) to adjust the angles. Join the National Bike Challenge - Back for 2015! Thanks for lunch, Donatos Pizza! The 2015 Ohio Bicycle Events Calendar is here! We had Spring Fever! And the Cure! Define your life. In St. Lucia!